Orders placed before 11:00 am will be manufactured and shipped the same day. Delivery within 3 days. 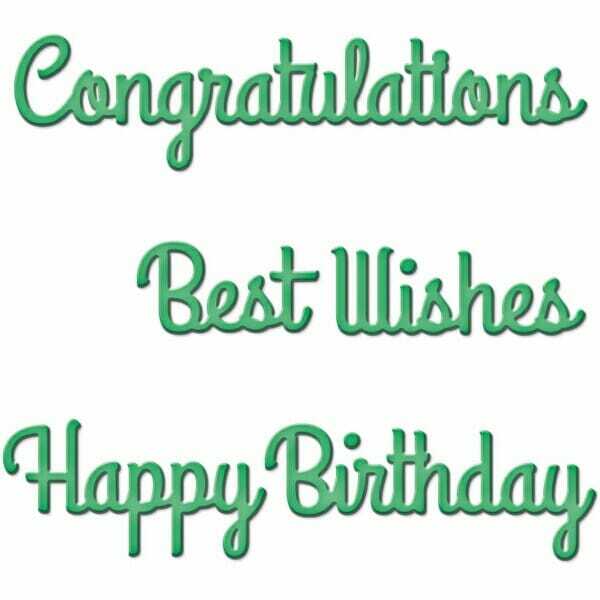 Some of the most used sentiments are offered in this set: Congratulations, Happy Birthday and Best Wishes. Use them separately or together, the choice is yours. Customer evaluation for "Spellbinders - D-Lites Sentiments One"
We are leaving marks ... since the last millennium. As one of the first companies, we already had an Internet presence in 1999 with our broad selection of individually designable stamps and accessories. Today we deliver our products to thousands of satisfied customers all over Europe. Selected solid components and state-of-the-art, high-resolution laser technology ensure that our stamps perform their work for a very long time and with precise quality. This is why private customers like them just as much as large companies or authorities that require large quantities. Ordering via Internet not only allows particularly favourable pricing, but also unrivalled convenience and flexibility. From your home or office, you can design your desired stamp(s) exactly according to your ideas. Designing a stamp in our shop is very easy, regardless if you want to create a simple text stamp or a stamp with a multi-coloured company logo. This also applies to address labels and company-specific T-shirt embroidery. Our free hotline will be happy to answer any questions you may have quickly and competently. Individual orders are usually delivered to the customer within 48 hours at the latest. We also offer impressive delivery speed for large orders. We deliver on account, insist on low shipping fees and offer a money-back guarantee if you are not satisfied. In addition to over 450 different stamp models, you will also find many related, useful things in our shop that you can permanently mark with your sign. This includes individually designable embossers, signs, address labels, textiles and gift ideas for advertising purposes. * All prices incl. VAT excl. shipping costs. Subscribe to our free stamps4u.co.uk newsletter and ensure that you will no longer miss any of our offers or news.